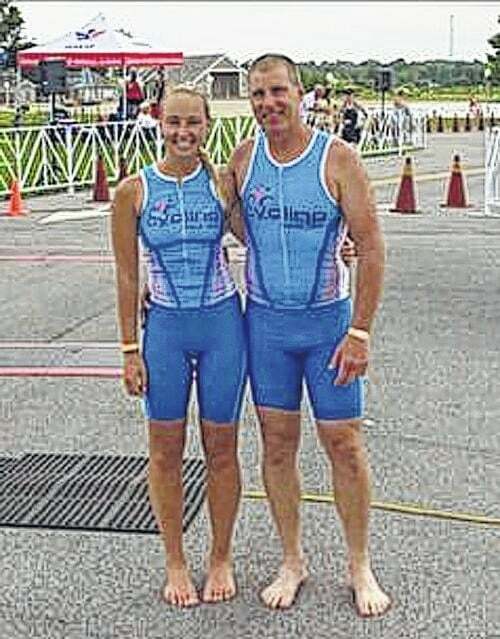 Jamie and Bob Chipka of the Cycling Sports Center team competed in the Maumee Bay Triathlon on June 21. Jamie competed in the Olympic Individual 20-24 age group. Bob competed in the Olympic Individual 50-54 age group. Jamie and Bob Chipka of the Cycling Sports Center team competed in the Maumee Bay Triathlon on June 21. Jamie competed in the Olympic Individual 20-24 age group. Her total combined time was 2 hours, 38 minutes, 54.5 seconds. She completed the swimming portion of the race in 24 minutes, 38 seconds. She finished the bike section in 1:13.59.5. Jamie completed the run in 57:17.3. She placed first in her age group and 53rd overall. Bob competed in the Olympic Individual 50-54 age group. He placed third in the age group and 18th overall. His total time for the event was 2:25:24.8. Bob finished the swim in 26:24.5. He completed the bike race in 1:04.18. He then wrapped up with a time of 52:30.8 in the run.